A Quote-Get back or I will shoot! Boomer's co-pilot, Lt. Helo, is a selfless warrior who gives up his seat to Dr. Baltar during the escape and is left behind on Caprica. 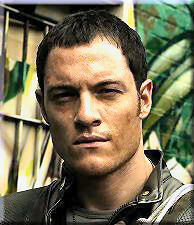 Lieutenant Helo is a Raptor pilot onboard the Battlestar Galactica. He is in his mid-twenties and has a perpetual tan with an athletic build. Helo is Lieutenant "Boomer" Valerii's co-pilot and the two build a bond together. Helo is a soldier who is willing to sacrifice himself for the greater good of another individual. Very selfless in action, he wins the respect of the members of his squadron. He is left behind on Caprica where he gave up his seat in order for Baltar to escape.